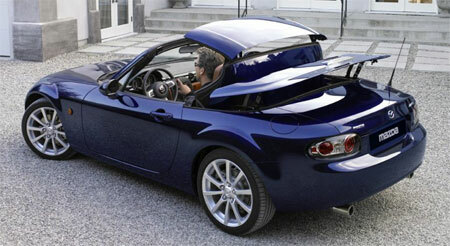 Mazda will be unveiling it’s hard top roof Mazda MX-5 at the 2006 British International Motor Show. The Motor Show will be held from the 18th of July 2006 to the 30th of July 2006. Mazda’s most successful cult roadster the MX-5 Miata originally came with a canvas soft top. The addition of a powered retractable hard top model will give the Mazda an edge in it’s battle against it’s roadster wars competitor the Pontiac Solstice which does not feature an automatic powered hard top… yet! Do check out my previously posted video on the Mazda MX-5 in Top Gear, where the Top Gear crew pitches the Mazda MX-5 against a greyhound on the dog’s home turf.